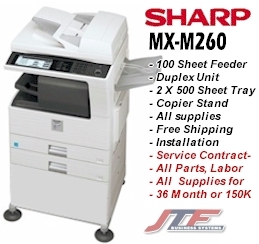 Sharp MX-M260 Copier - Cabinet, Delivery, Installation & 36 Month Service Contract Nationwide (All Parts, labor & Supplies). Versatility and performance, all in one reliable unit: that's the Sharp MX-M260 copier. This powerful multifunctional copier/printer combines a fast 26-ppm print/copy speed and time-saving reverse ADF and auto-duplexing features with exceptional 1200-dpi laser output to keep workflow moving forward and looking great. Convenient options expand its functionality to include network printing and scanning, Super G3 faxing, web-based management, as leading edge security features.